Bad Sector on HDD ( hard drive ) is often times occurs on a computer or laptop that we use everyday , could be due to physical bad sectors or software bad sectors the two likely is bound to happen on the hdd ( hard drive ) is too much to run activities or many run heavy applications. Bad sectors on the hard drive is physically the most likely can no longer be repaired , but the data can still be saved in a service place or serve rescue the data on the hdd ( hard drive ) that is damaged . At the HDD ( hard drive ) that is not in bad physical sector is only on the software or similar I also do not know too much about it , but I 've tried on several multiple hdd ( hard drive ) and some are bad sectors can be recovered and partly can not be repaired anymore . If the hard drive is starting to give a fairly loud noise sometimes even then still can be fixed , but sometimes not long back become bad sectors usually windows will often hang / lag and will only get worse until it can not be used again . Therefore if the hdd ( hard drive ) has come out very loud sound immediately backup all existing data to your second hard disk. 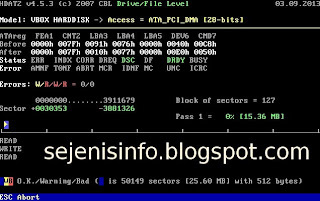 Some causes of disk bad sector affected computers restart repeatedly or frequent power outages due to strong not hold a lot of power, so the harddisk experiencing frequent crashes and hangs , and the hard drive has bad sectors affected then by the time we are running an application and often jammed or lag and hangs up the application could not run again and must be restart and re -run windows . How to check whether the hard drive bad sector affected or not , we can check with Minitool partition wizard, a windows software that we can use to create , cut , wipe and check the hard drive from bad sectors. The minitool partition wizard can be use on windows xp, windows 7 and windows 8. 1 . Download and install the application Minitool partition wizard here . 2 . Once downloaded and installed we can directly use . 3 . Open Minitool partition wizard and check the hard disk with right click on mouse and choose "Surface Test" text and click the left mouse , then after the new window appears please click on the start button is on the top right. 4 . Scans will run , if the color of the small box is the green the sector or block is safe or good , and if the little box that have been passed is red then it is bad news because it is the sector / block that is damaged or bad sectors , should be immediately fixed by other software if the bad sector can be repaired with hard drive recovery software. 1 . Download HDAT software here . can be used for computers , laptops and netbooks . 2 . Once downloaded extract it to a folder and burn on CD/DVD blank using applications for example ISO buster, isomaster or Nero. In addition, if you have a HBCD CD / DVD use it there are lot of software for hard drive data recovery software and more. 3 . In this example I use HDAT is in HBCD please search in google by typing HBCD ISO file to download it . 4 . Once selected hard disk to be repaired enter on the keyboard and select the first part of "Drive Level Tests Menu ". 5 . Then choose the first part also the " Read and Repair bad sectors " that will be running disk repair process soon . 6 . Wait for the scan and repair process hdd up to 100 %, the scan process is blue color and if not found a bad sector on the hard drive the line will be all blue, but if the line are red with B letter that has been is bad sectors and if hdat able to fix the bad sectors and after re-scan the bad sector will be gone , which means bad sectors already fixed and there is no more damaged sectors . 2 . Once downloaded and installed then run hdd regenerator and select the hard drive to scan and recovery bad sector. 3 . In above picture i use hdd regenerator from HBCD, after being selected to the correct hdd then select the first part of the number 1 of choice is scan and repair. 4 . To begin the scan and repair hard drives ranging from 0 ( zero ) then click enter directly from the keyboard and if you want to start from the middle or a specific part then typing the numbers of which we will scan for example ranging from 1gb then typing 1024mb and enter. 5 . From the picture above on No. 4 that is currently running hdd regenerator to repair the damaged block or sector , if the box is white after the scan is complete all that is 100 % then the hard drive does not have problems and if the rectangular box is have the "B" letter and "R" sign that the hard drive already fixed. There is a big possibility if the hard drive has been severely damaged in the destruction of the physical damage, although there has been contained the letter " R " or a sign that the hdd has been successfully repaired and after we restart the computer in question and recheck with the hdd regenerator and if there are still have bad sector so the hard drive can not be fixed, Try using low level format tools, and there are many software to fix a damaged hard disk in a different method. Hopefully can help and hopefully successfully to recovery your bad sector on hard drive. Nice and interesting! HDat is good software tool for repair bad sector of hard disk for non physical damage. But if any physical damage or scratches on hard disk then go for only trustworthy company to recover data or rectify bad sector. Excellent article! In open market there so many tools or software is available to remove bad sector in HDD. HDAT one of them, but believe me its a super working when I use it. Keep sharing as many as people. The HDD bad sector occurs due to many circumstances like power failure or incomplete shutdown. The logical failure can detect and fix by data recovery software or tool. Here the Minitool partition wizard and HDAT are good to repair the bad sector on the HDD. 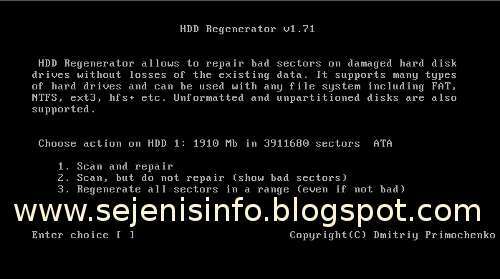 The HDD Regenerator is a wonderful tool to repair the bad sector. It uses an algorithm developed for data block regeneration. The expert professional is good for physical damage correction. Recover data from formatted Windows partitions having FAT and NTFS file systems. It completely repairs the hard drives and recovers deleted, permanently deleted, lost and inaccessible data files and allows the users to reuse them. Good blog and very useful blog for service people. Hard disk issue can cause boot disk failure error and system might not work. We are into Laptop service in Chennai and hard disk issue are very common. Good post with lots of details. Good to read and understand. Hard disk problems can cause booting problem. If there is loose connection then one should remove the wire and plug it back into the hard disk again and it might solve the problem and you do not have to go to computer service center. I read some articles on this site and I think your post is really interesting and has great information. Thank you for your sharing. It is good to know that there are posts regarding topics like these. We are cctv camera dealers in Chennai and posts like these are very useful for our team to upgrade ourselves and enhance our knowledge regarding security systems. Nice information.. Thanks for sharing. Addmen group is one of the best omr software provide in India and abroad also. If you want any kind of omr software India you just have to visit our website and see the different omr software. Hi Zein Okeh, Nice post on servicing and mechanism of dvr. Reading posts like these are very helpful to us because we are dvr dealers in Chennai and we often have requirement of service. Write more about ip configuration and other cctv issues. Thank you. Explain well in whole article. Its an informative post.